What is OSA? Obstructive sleep apnea (OSA) is a disorder characterized by repetitive episodes of partial or complete collapse of the upper airway during sleep leading to apnea and hypopnea. In severely affected patients more than 30 apneas occur per hour and are associated with oxygen desaturations, increased respiratory effort, and arousals from sleep. Obstructive sleep apnea (OSA) and type 2 diabetes are both closely related to obesity and their prevalence is increasing due to the rising average body weight in Western countries. The findings of epidemiological studies have implicated that OSA increases the risk for cardiovascular disease, and metabolic disturbances, such as insulin resistance, may link OSA to vascular morbidity. Symptomatic OSA is highly prevalent and occurs more predominantly in man than in woman. (The higher prevalence of risk for OSA among men than women could be related to the greater tendency toward android fat distribution). Chronic sleep fragmentation, sleep deprivation, and intermittent nocturnal hypoxemia have been implicated in metabolic dysfunction, including altered glucose metabolism and adverse cardiovascular complications: many patients are hypertensive and could have stroke, heart failure and ischemic heart disease; the worse the obstructive sleep apnea, the worse the glucose control. In insulin resistance, body cells become increasingly resistant to the effects of insulin and this condition precedes the evolution of type 2 diabetes where the pancreas cannot produce sufficient insulin to maintain normoglycemia. Glucose tolerance refers to the ability to maintain euglycemia by disposing of exogenous glucose via insulin-mediated and non– insulin-mediated mechanisms. Normal glucose tolerance depends on the ability of the pancreatic beta cells to produce insulin. As insulin sensitivity declines, insulin secretion increases to maintain normal glucose levels. Hyperinsulinemia may increase insulin resistance, because high levels of circulating insulin can lead to internalisation of the receptors for insulin itself, thus rendered unavailable. Diabetes becomes manifest when the pancreatic beta cells fail to compensate for the decreased insulin sensitivity. 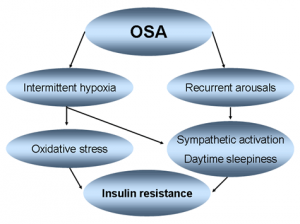 Due to the higher prevalence of diabetes in patients with OSA asMECHANISMS: compared with the normal population, it has been postulated that OSA may be a causal factor in the pathogenesis of diabetes. Potential mechanisms that may underpin this relationship were evaluated in animal and human experimental studies and include intermittent hypoxia, arousals from sleep with concomitant sympathetic activation and sleep fragmentation. Furthermore, other mechanisms could include consecutive increases in oxidative stress. It is likely that other factors are dysregulation of the hypothalamus-pituitary-adrenal axis, and activation of inflammatory pathways, resulting in abnormal glucose metabolism. Furthermore we can also evaluate an increase of ghrelin levels and a decrease of leptin levels. One of the mechanisms linking intermittent hypoxia with insulin resistance may be the increased oxidative stress, which itself has been implicated as a contributor to the onset of diabetes. The exact mechanisms by which oxidative stress may cause insulin resistance are unknown. In an animal model of long-term intermittent hypoxia (8 weeks) simulating oxygenation patterns of OSA in mice, several NADPH oxidase proteins were activated promoting oxidative injury and proinflammatory gene expression. Hypoxia and re-oxygenation accounted for a state of oxidative stress and significant increase of reactive oxygen species in mice. Repetitive cycles of intermittent hypoxemia followed by reoxygenation may trigger the formation of reactive oxygen species, eliciting the release of inflammatory cytokines such as TNF and IL-6 and C-reactive protein. Inflammatory cytokines play an important role in mediating peripheral insulin resistance by inhibiting glucose uptake by fat and muscle, increasing the level of counter-regulatory hormones and inducing the release of free fatty acids. Arousals are transient cortical activations during sleep that may occur as a result of interrupted ventilation in OSA. Mice exposed for 35 days to intermittent hypoxia showed increased levels of catecholamines and elevation in blood pressure. Increased sympathetic nervous system activity has been linked to insulin resistance in population based studies. A restricted sleep time of 4 hours per night lead to considerably increased sympathetic activity and a nearly 40% slower rate of glucose clearance when compared to 8 hours of sleep. Fragmented sleep achieved by auditory and mechanical stimuli (approximately 30 events/hour) lead to a decrease in insulin sensitivity and to an increase in morning serum cortisol levels confirming increased nocturnal sympathetic activity. Hypoxia and hypercapnia caused by sleep-disordered breathing provoke sympathetic nervous activity, releasing epinephrine, norepinephrine, and cortisol. Sympathetic hyperactivity and increased catecholamine impair glucose homeostasis and induce insulin resistance by increasing glycogenolysis and gluconeogenesis. 1)	Insulin not-secretion lead to an increase of glucagon secretion -->glucagon activity can be compared to that of epinephrine. How? Glycogen phosphorylase cut glucose from the non-reducing-end of glycogen and attaches them to the phosphate groups. Another enzyme, phosphoglucomutase, converts glucose-1P into glucose-6P that enters directly in glycolysis, or is converted into free glucose from Glucose-6-phosphatase. How the Glycogen phosphorylase is activated? Catecholamine act on liver β2 receptor for them, and this active the G-protein (αβγ). The subunit GSα, now, binds Adenylate Cyclase and this lead to the cAMP synthesis. Now cAMP activate PKA that phosphorylates glycogen phosphorylase kinase. This enzyme now phosphorilates the Glycogen phosphorylase, and thank to its action we have an increase of free-glucose levels. Moreover the active-pka phosphorylates glycogen synthase, inactivating it. (= NO glycogenosyntesis). How? Pka phosphorylates the Bifunctional Enzyme, activating fructose, 2-6 biphosphatase and inhibiting phosphofructokinase-2. In this way decreases the levels of fructose bisphosphate 2 6, which can no longer activate the phosphofructokinase 1, essential enzyme of glycolysis. (= NO glycolysis). Increased sympathetic activity also affectsthe levels of peripheral appetite hormones, inhibiting leptin release and stimulating ghrelin release. Lower leptin levels and higher ghrelin levels act in concert to further activate orexin neurons, resulting in increased food intake.With the onset of OSA, individuals develop leptin resistance, which in turn contributes to further weight gain. The treatment of choice for OSA is continuous positive airway pressure (CPAP) therapy. The CPAP device generates a positive pressure in the upper airways via a breathing mask, preventing airway collapse, apneas, and sleep fragmentation, thus providing a more restful sleep without intermittent hypoxia and recurrent arousals from sleep.